Animal Justice Canada Legislative Fund (AJCLF) today launched a new national campaign to have basic rights for animals enshrined into Canadian law through the Animal Charter of Rights and Freedoms. The Animal Charter would ensure animals are treated as sentient beings instead of mere property, would guarantee the rights and freedoms that make life worth living, and give all animals a chance to have their interests represented in court. Although opinion polls consistently show that Canadians care deeply about animal welfare, the law affords inadequate protection to animals. From our pet dogs, to captive orcas, to pigs kept on factory farms, legal protections for animals are often weak, and animals don’t have the right to see their interests represented in court. The Animal Charter would bridge the large gap between Canadians’ expectations of how animals should be treated and the reality of what they are currently forced to lawfully endure. The Animal Charter is premised on the recognition that animals experience suffering and pleasure in a way that is not biologically distinguishable from that of humans; that discrimination on the basis of arbitrary characteristics—like species—is a violation of equity, natural justice and the rule of law; and that our legal system must not exclude the most vulnerable members of society. 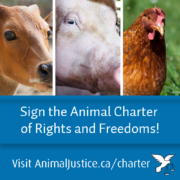 The Animal Charter can be viewed and signed at AnimalJustice.ca/Charter.